Beat This Caption Contest 110 Winner – Caption Contest Funny Clever Witty Enter Today! 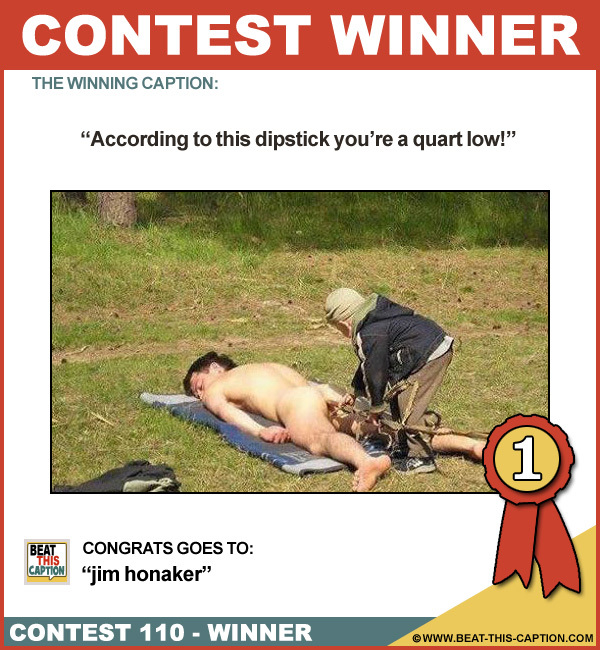 According to this dipstick you’re a quart low! I love it! I’m so gonna use that line… Great Caption! :) You WIN! All the Hispanic kids kept beating him with sticks, until he fell, and no candy came out! Always “check for bees” first !! It’s a bit like using a ramrod to load a cannon! Enemas never seem to work! What – you’ve never seen a redneck thermometer before? I’m trying to roast my marshmallow! This outta ruin his planking career…! This is the real way of sticking it to the man!